Kato Unitrack is the 'official' track of T-Trak. Although you can use other brands of track on your module, the track that peeks over the ends of the module and attaches to the next module -must- be Kato Unitrack. The rail joiners of the UniTrack are what holds the modules together! - concrete-tie double-track - these pieces take care of both mainlines at once! And the curves are superelevated! - concrete-tie single-track - this is sold to expand the track around the V15 starter-set station area, and may only be available in 248 mm length (#20-875). - concrete-slab double track - instead of ties, the track is anchored to concrete slabs. Curves only available in 414mm/381mm radii superelevated double-track and easement. - Single-track viaduct ('concrete' bridgework and wooden ties) - This is intended to be supported on piers. Only available in single track. Longer equipment may be a tight fit around the corners! - double-track viaduct ('concrete' bridgework and concrete slab track support) - also intended to be supported on piers. Curves only available in 381mm/414mm superelevated double-track and easement. Straight sections of Kato Unitrack comes in multiples of 62mm: 62mm, 124mm, 186mm, 248mm (2.44", 4.88", 7.32", 9.76"). You can mix and match until you get the right length! The T-Trak single module uses 310mm of track, which is 5x62mm, or 248mm+62mm, or 186mm+124mm, etc. 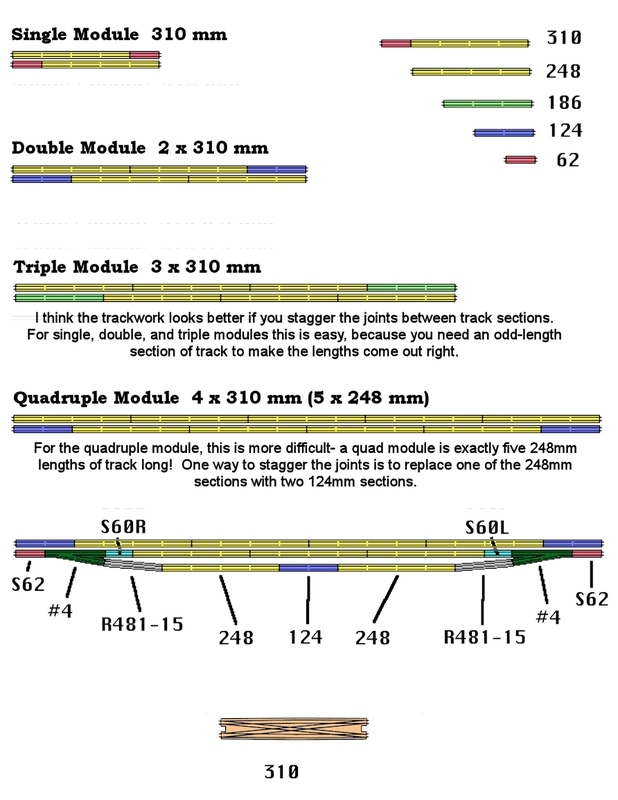 Although any combination of track that adds up to 310mm is OK, the fewer pieces of track on a module the better. Each joint between sections is another place where electrical 'gremlins' can lurk and cause poor contact. Here's a list of some of Kato's track part numbers. You'll have to buy packs of track-- most sold 2 or 4 pieces per pack-- which means you'll probably end up with enough track for at least 2 modules to start with! Looking at a row of TTrak modules you see the long straight mainlines heading down the front of the table. But it's -boring-! 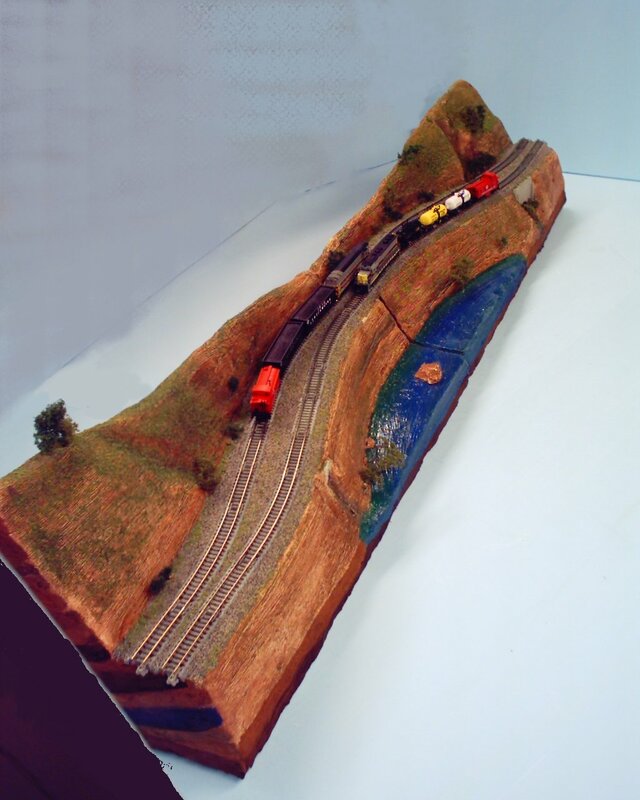 I wanted something that would let me have scenery in front of the tracks as well. So I built a pair of double-wide modules as 'swing' or offset modules. The track swings from the front of module 1 to the rear; module 2 reverses the swing; it's a mirror image of the track on the 1st module. The track at the rear of the modules is spaced the same distance from the back of the module as the normal distance from the front of the module. Any standard module(s) can be spun end for end and inserted between the swing modules. This makes it important that your modules look good from the back as well as the front! that adds up to 190mm. The first two columns describe the track for 8-1/4" deep double-wide modules. Column 1 uses the 25mm track spacing-- these are the modules I've built. Column 2 uses the 33mm track spacing. Having the track move back and forth breaks up the long straightaway and provides an excuse (and a place) for more scenery in front of the tracks. The curves on all versions are nice and broad; I think most equipment will handle them easily. The center section of the 'original' version is 190mm long (not quite 7-1/2"). The 33mm center-to-center versions have 124mm straight sections (not quite 5") in the center. The shallow version has curves that are about 9" broader than the other 2 versions. These central straight sections should avoid most S-curve problems. 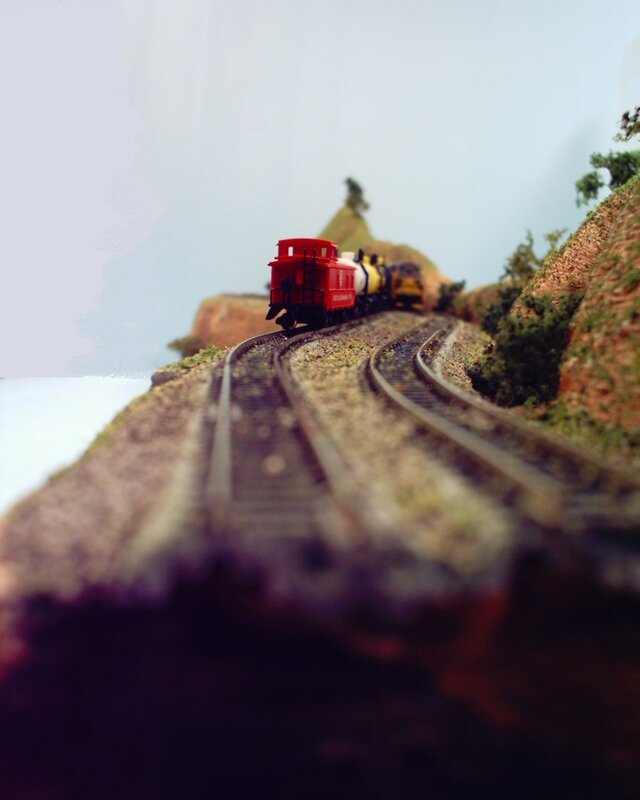 When you're using 33mm center-to-center track spacing you can use double-crossovers and bridges wherever you like. If you want to use a double-crossover be sure to read the ELECTRICAL section concerning "Blue to the Outside!" Was there an issue using the double-crossover or bridges? Yes. 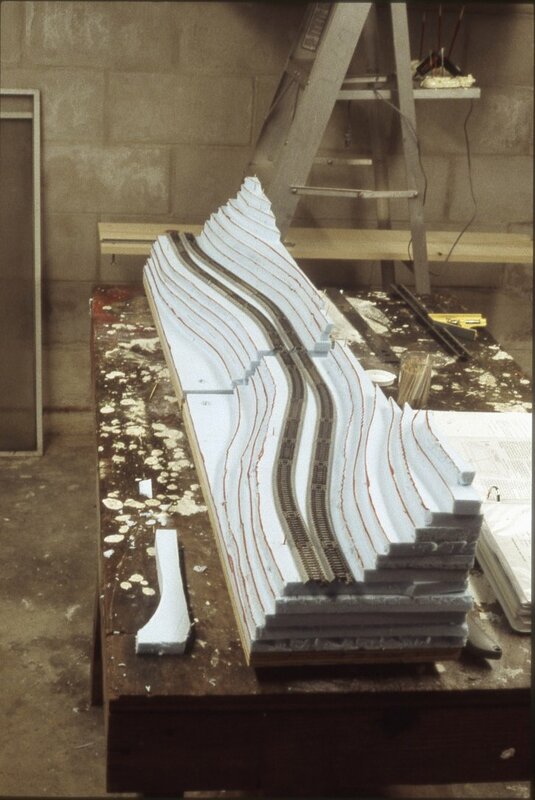 When T-Trak was originally presented as a modular standard, it was intended that the two mainline tracks be butted against each other-- center-to-center spacing was 25.4mm (1"). This wasn't an issue on straightaways; most equipment (save maybe double-stack intermodal or car carriers) had no problems. Corners were more of an issue-- running tracks that close together on the curves would have had a lot of trouble with side-swiping trains on the other tracks. Short straight sections on the corner modules provided space between the tracks and prevented problems. But Kato had designed UniTrack to work on 33mm spacing, center-to-center. Their double crossover, two-track bridges, and, later, double-track pieces didn't fit with the original standard. It is possible to use several shorter pieces of track and take advantage of the play in the rail joiners to swing the tracks from 25.4mm to 33mm center-to-center-- it's only a 4mm sideways move for each track (not quite a quarter inch), but it meant that you needed a double-wide module (at least) to use one of the bridges or double-crossover. The T-Trak standard was modified to allow 33mm center-to-center track spacing. The outside mainline is still 1-1/2" back from the front edge of the module, but there is now a gap between the ballast strips of the mainlines (about 8.4mm). When your modules use this spacing, you simply use the bridges, crossovers, and double-track sections wherever you want. "THESE MODULES ARE TOO SMALL TO DO ANYTHING WITH!" I've been violating the module size standard since I first thought about building a module-- I went right to designing double-wide and even a quad-wide module. I thought that a single-wide module didn't give enough space to -do- anything! When asked, "Why is this?" "I always try to put as many words in the last line as I possibly can." Corners using 33mm track spacing use two different radii of UniTrack on each corner. Kato has been busy! AGAIN!! This section used to show three corner sizes usable for alternate track spacing. Now I show NINE corner sizes, including two usable only with -very- short equipment! The diagram shows 11 radii of UniTrack, and the nine corners you can make with them. There are two new curve radii available from Kato: 183-mm (7.2") and 150-mm (5.9") (sold as 7" and 6"). These would live on equally tiny T-Trak bases: 10.5 and 9.2 inches square! These would only be usable with straight modules built using the original specifications-- 8-1/4" deep. The next three larger corners, on 11.8", 13.1", or 14-3/8" square bases, will fit back-to-back on standard 30" (~75cm)-wide banquet tables. The largest four, on 15.7", 17", 18.5", and 20.9" square bases, will require some additional tables! Two of these curves back-to-back will fall off a standard table. The 2 smallest corners ((9.2" (150/183)) and (10.5" (183/216))) are TINY! I think you could only run something like those 'beer-can' tank cars and the just-as-short hopper cars, pulled by an 0-4-0 steam engine! Or maybe mine ore cars pushed by a GOP (Grizzled Old Prospector). The (11.8" (216/249)) corner should only be considered for 40' boxcars, 4-axle diesels, and trolleys. The next-size-larger corner (13.1" (249/282)) should be able to handle large equipment. I've run 6-axle diesels on a 249 mm corner, and except for a lot of 'overhang' they work fine. Your mileage may vary! The 14-3/8" (282/315) corner is pretty much the 'standard' size for 33mm track spacing. It's the largest corner that will fit back-to-back on a standard table using standard UniTrack without hanging over the edges. Any corner will be more restrictive on the inner track than the outer track. Now we get to the four largest sizes: ((15.7" (315/348)) (17" (348/381)) (18.3" (381/414)) (20.9" (447/480))). All four will require side-by-side tables if you want a complete circle. The drawing below shows two odd sizes used in the same layout. If pairs of same-sized corners are used on diagonally opposite corners, the layout will fit together without specially sized modules. The only problem is if you want to use junction modules across the center of the layout-- they won't line up. Large-size corners can be built in 15.8" (315mm+348mm), 17" (348mm+381mm), 18.3" (rounded off to 18.5"?) (381mm+414mm) and 20.9" (447mm+480mm). The 414-mm radius curves are only available paired with 381-mm radius curves in the concrete-tie double-track super-elevated curves. The 447 + 480mm curves are only available as concrete-tie double-track super-elevated curves. 282-mm and 315-mm curves are available as single piece wood-tie curves, or paired in concrete-tie double-track super-elevated curves. The chart below shows the radii and module sizes for the eight corner module sizes currently possible with Kato UniTrack. I've included the Kato part numbers, usually for 45-degree track sections. The 381 mm sections are 30-degree track sections. The first 25mm-track-spacing corner for T-Trak specifies Kato 20-170 curved track: 8.5" radius (216mm). These are constructed on 12-1/4" square modules. Unfortunately, larger engines have problems with curves this tight. All of the above use 3 short sections of track from the Unitrack 20-945 Short Piece Assortment: 45.5mm / 1-3/4" straight at either end of the outside track, and a single 29mm / 1-1/8" straight between the two curved inner sections. 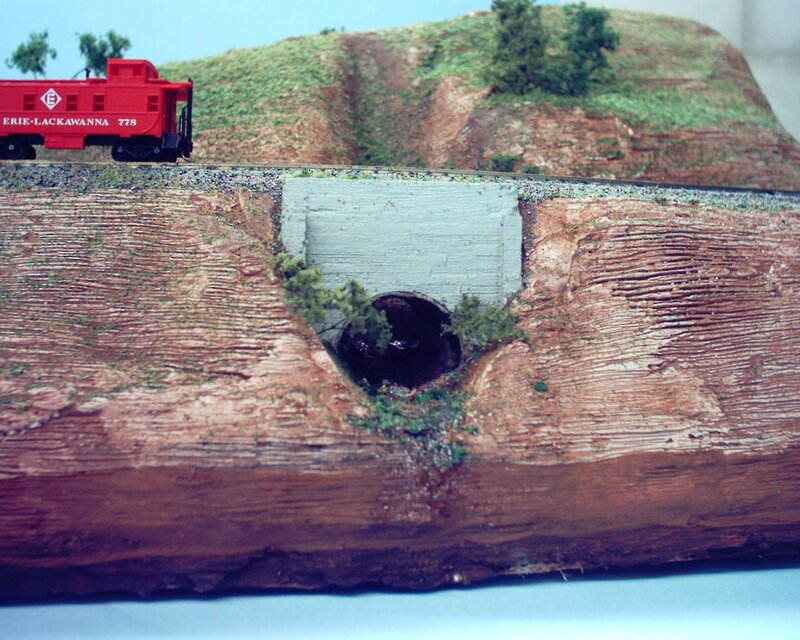 This allows you to use the same radius track for both the inner and outer tracks. You can also use flextrack for the corners and use short sections of straight Unitrack at the interfaces. This maintains the locking action of the Unitrack rail joiners between modules. A layout with the largest of these corners will just fit on a 30" wide table. This would put all of the modules right at the edge of a 'standard' 30" table-- I suggest one of those under-the-carpet no-skid pads to make sure things don't jiggle off the edge! The 282mm / 11.1" radius should be able to run most N steam engines and all N diesel engines. The 249mm / 9.8" radius can handle most diesel engines and some steam; the Kato Mikado handles the 9.8" curves acceptably; the Bachmann 2-8-0 Consolidation does also. The Kato RDC cars look a little funny around the 249mm / 9.8" corners-- the cars are long, and there's quite a bit of overhang.